I first heard of the Wooting brand and their proposed Wooting One keyboard in late 2015. Looking into it more, I was skeptical about two people, Calder Limmen and Jeroen Langelaan, who no one had ever heard of before and who sought to bring to market a keyboard with analog control. It seemed like a pipe dream at the time, and when they added a third person, Erik Stakenborg, to manage the website, my opinion did not change. They then showed off a prototype design and.. it looked good. A few months of good marketing and publicity followed and lead to a Kickstarter campaign in the summer of 2016 that was funded within seven hours and went on to exceed its goal by 450%. This was a lot of money to work with, and it was at this point that I was perhaps the most skeptical on how things would go next. A continually updated blog, video logs on YouTube, open Discord channels, and Q&A sessions meant they were being very transparent about the whole venture, as the backers had wanted and hoped for. As such, despite delays in finalizing the switch design and final production hassles, they had convinced me about the legitimacy of the company and brand when it was finally time for mass production. When keyboards started shipping to backers recently, and with the product now up for pre-order globally, I figured I simply had to get my hands on one to see how well it works, and here we are today. Thanks again to Wooting for providing the review sample. 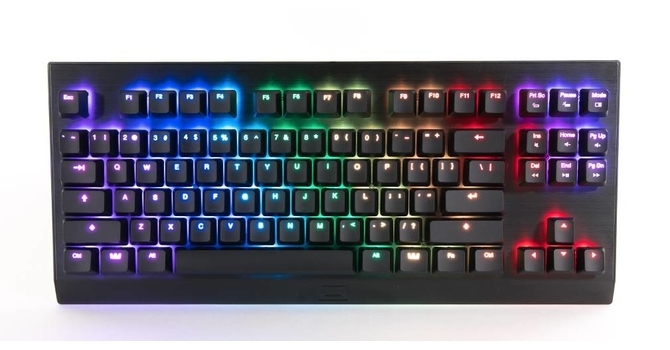 The Wooting One is the keyboard name, and it is a safe choice for the first product of what is essentially a start-up company. Wooting is going big on brand recognition here to where even the software driver is called Wootility. 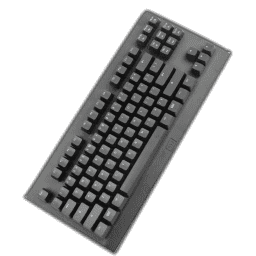 The name aside, the Wooting One is a tenkeyless (TKL) form factor keyboard with a singular black color scheme at this time. Based on the image above, we see that there is RGB backlighting as well. The unique selling point is no doubt the implementation of analog control, and we saw an adaptation of this in the Roccat Isku+ Force FX that used piezoelectricity on a 6-key zone, which was the only way they could get it to work on membrane switches. That implementation worked alright in all but fast-paced gaming situations where actuation and the amount of pressure applied both added time and reduced the actions per minutes. We will definitely dig deeper into what Wooting did here, but having it on all 87 keys is already a good start. Let us begin the review with a look at the specifications below. 0.91 kg / 2 lbs.